Arthritis is a complicated disease that can affect anyone, not just the elderly. There are many misconceptions about this common joint disease and some basic facts that everyone should know. Arthritis symptoms, such as pain, limited range of motion and fatigue discourage physical activity. Physical inactivity is a risk factor for diabetes, heart disease, and obesity. When you experience the first symptoms (Joint pain, swelling, redness, Joint warmth, stiffness, Loss of joint range of motion) of arthritis, you likely won’t even know what’s wrong. But it’s very important to be evaluated by your doctor if symptoms persist. People with arthritis often take medications to help control their symptoms. For most patients, there is no cure. To manage arthritis, lifestyle modifications are also important. Until there is a cure, the goal must be to live well with arthritis. 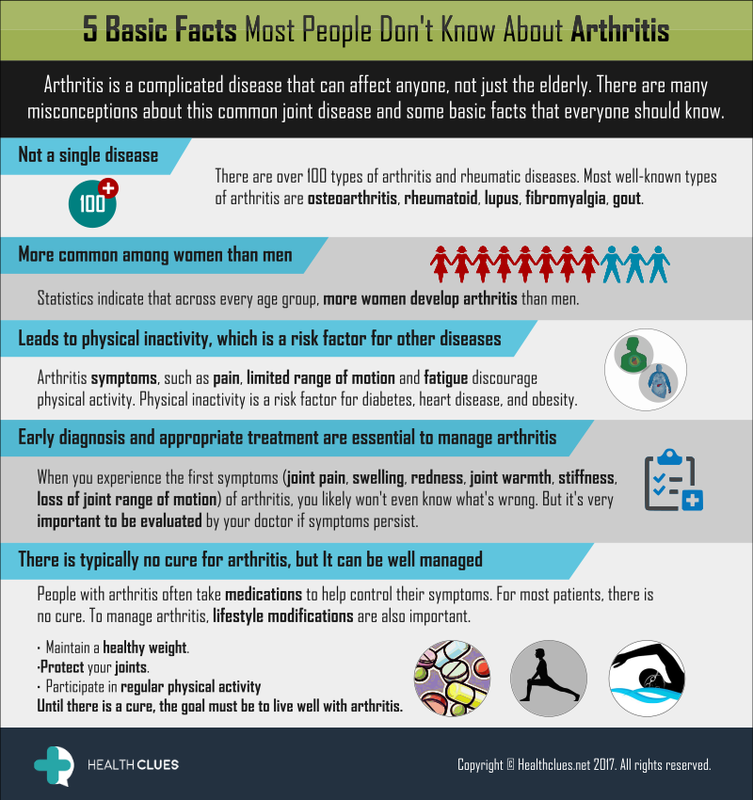 General, Infographics, Osteoarthritis, Rheumatoid Arthritis arthritis, gout, healthy joints, joint pains, osteoarthritis, rheumatoid arthritis. permalink. Thanks you for sharing a great informative information.